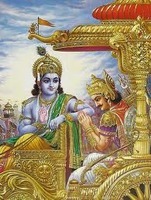 Om, O Bhagavadgita, with which Partha (Arjuna) was illuminated by Lord Narayana Himself and which was composed in the middle of the Mahabharata by the ancient sage Vyasa, O Divine Mother, the destroyer of rebirth, the showerer of the nectar of Advaita (teaching of Oneness in all things) and consisting of eighteen chapters – upon Thee, O Bhagavad Gita! O affectionate Mother! I meditate on you. Salutations unto thee, O Vyasa of broad intellect and with eyes like petals of full-blown lotus, by whom the lamp of knowledge, filled with the oil of the Mahabharata, has been lighted. Salutations to Krishna, the Parijata tree or the Kalpataru or the bestower of all desires for those who take refuge in Him, the holder of the whip in one hand, the wielder of the symbol of knowledge, and the Milker of the nectar of the Bhagavadgita. All the Upanishads are cows; the Milker is Krishna, the cowherd boy; Partha (Arjuna) is the calf; men of purified intellect are the drinkers, the milk is the great nectar of the Gita. I salute Lord Krishna, one who is the Guru for the entire world, son of Vasudeva, the destroyer of Kamsa and Chanura, the supreme bliss of Devaki. With Keshava as the helmsman, the Pandavas crossed the battle of river wherein the banks were Bhishma and Drona, the water was Jayadratha, the blue lotus was the King of Gandhara, the crocodile was Salya, the current was Kripa, the billow was Karna, the terrible alligators were Ashvattama and Vikarna, and the whirlpool was Duryodhana. May this lotus of the Mahabharata, born in the lake of the words of Vyasa, sweet with fragrance of the meaning of the Gita, with many stories as its stamens, fully bloomed by the discourses on Hari, the destroyer of the sons of the Kali age, and drunk joyously by the bees of good men in the world, day by day become the bestower of good to us. I salute that Madhava, the source of supreme bliss, by whose grace even the dumb man speak eloquently and the handicapped cripple can cross mountains. Salutations to that God, Whom Brahma, Varuna, Indra, Rudra and the Maruts praise with divine hymns, of Whom the Vedic pundits chants with Sama Veda in the Pada and the Krama methods, and by the Upanishads, Whom the Yogins see with their minds absorbed in Him through meditation, and whose end the hosts of Devas and Asuras know not.